Article first published as Book Review: ‘Keeping Kyrie’ by Emily Christensen, Ph.D. on Blogcritics. “Keeping Kyrie” by Emily Christensen, Ph.D., tells the story of the Christensen family. Shortly after Emily and Nathan married, they experienced some life changing events. Unfortunately, many of them were painful, such as the loss of both of Emily’s parents, her bout with cancer, miscarriages, and infertility. Emily also had a hearing impairment and underwent cochlear implant surgery. During this time, the couple also fostered more than seventy children. Of these children, six with special needs became a permanent part of their family. Each child had their own painful experiences from which they needed to heal. Many were affected physiologically and psychologically resulting from having parents that were on drugs. The children suffered physically from the effects of being in the womb with someone who was using, and psychologically from the pain and disappointment of having parents that couldn’t get it together to keep their family whole. Some of these children were also horribly abused. Emily frequently used her knowledge and experience as a Marriage and Family therapist to help the children; she also did what she could to try to preserve contact with the birth parents, if they were willing. “Keeping Kyrie” tells the stories about how all six of their adoptive children came to be part of the Christensen family, but the main focus is on Kyrie’s story. She was the youngest one to enter the Christensen home where her half-sister was already a part of the family. Kyrie came into this world with the lower part of her face improperly developed and a tiny airway with which she struggled to breathe through. She was not expected to make it and had to undergo many painful surgeries, of which had no guarantee of the outcome. Relying on their Mormon faith and the prayers of their congregation, the Christensen’s held on to the hope that Kyrie would not only live, but she would be as normal as possible. Whenever Emily was away at a hospital with Kyrie, Nathan would be at home with the rest of the children taking care of their needs. The couple’s dedication to these children was so heartwarming because it was obvious that they shared the same mission to help these children have as fulfilling and normal lives as possible. In doing so, they were also blessed with being able to love these special souls. While reading this incredible story, I experienced so many emotions. There were times when I wanted to shed tears for the painful experiences that the parents and each child had to go through, especially if they were caused by neglect of the birth parents. Emily’s refusal to give in and give up in spite of all the personal issues she was dealing with was inspiring. Any of these things would be enough for a normal person to step back and focus on herself instead of seventy foster children! When she converted to Mormonism, little did she know what a huge role the church would play in her life. In addition to meeting her husband and having a whirlwind courtship, she also benefited from the prayers and blessings offered to the family whenever needed. The sense of community within this religion is exactly what this family needed as they endured their hardships. Their family life also brought a lot of laughter and joy. It is obvious that each child is a special being, meant to be a part of this amazing family. Being able to see their photographs in the book was wonderful. It helped make me feel like I had really met them. 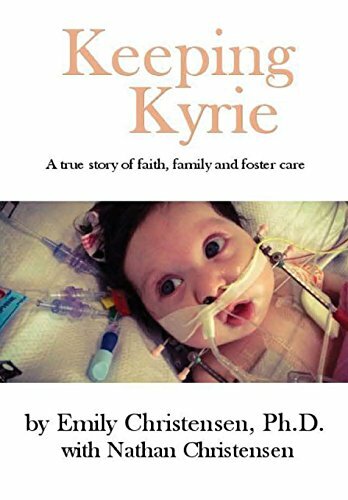 I thoroughly enjoyed reading “Keeping Kyrie” by Emily Christensen, Ph.D., and I highly recommend it for social workers, counselors, persons considering fostering or adopting, and medical professionals who deal with the health needs of children.